Silymarin with Antioxidant is a combination that works in balance and synergism in protection and integration of the physiological functions of the hepatocytes. 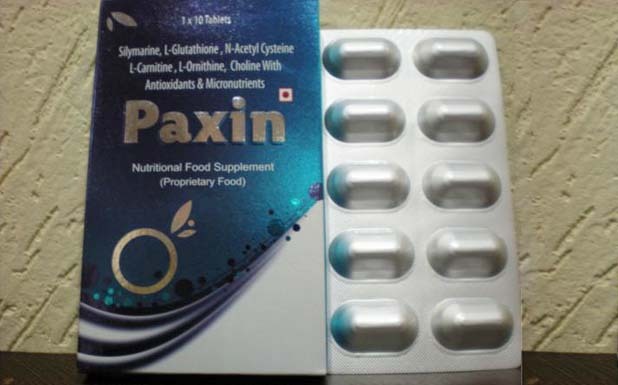 Silymarin is a potent antioxidant and stabilizer of the liver cell membrane and other inner biological membranes of different intercellullar organelles.It apparently promotes liver cell protein synthesis and decreases the oxidation of glutathione. Silymarin is a powerful antioxidant said to protect liver cells (and other cells in the body and brain) from toxins and beneficial in a number of diseases involving liver disease, if in the early stages. Silymarin is a unique flavonoid complex-containing silybin,silydianin & silychrisin-that is derived from the milk thistle plant.It is a powerful antioxidant and also enhances protein synthesis by acting on ribosomal RNA, which not only have a positive effect on digestive function but also on the general condition of the patient.Apart from this, other antioxidants included in this combination are Vitamin E,Vitamin C, Vitamin A,Selinium, Zinc,are present in suitable amounts. This Combination provides protection against the free oxygen radicals, the main cause of damage to hepatocytes content & function in different types of liver injury. Acetylcysteine has also been added, which is a precursor to glutathione, the most important intra & extra-cellular antioxidant (the safest & most convienient). Acetylcysteine has the ability to enter the liver cells to yeild glutathione compensating for the depleted reserve due to liver cell injury & thus performing its role in quenching & scavenging the harmful oxygen radicals. L-Glutathione is an antioxidant that our body produces from three basic amino acids that are found in our food. Our body makes it and uses it, along with the other vitamins that we ingest, as a hard line defense against all of the hazards that cause us to grow sick and old. This is important because research into this specific anti-oxidant has shown that it can actually cure disease, regenerate damaged tissue, minimize the side effects of chemotherapy, and treat cataracts. L-carnitine, or carnitine, is a nutrient present in most cells of the body that plays a crucial role in cellular energy production by transporting fatty acids into cells to be burned for energy. L-carnitine is produced in the liver and kidneys and can be found in higher concentrations in active body cells and tissues, such as skeletal muscles, the heart and the brain. L-carnitine helps to reduce oxidative stress and has been used as an adjunct therapy, meaning it is used in addition to other medical treatments. Conditions treated with carnitine include: angina, heart failure, Alzheimer's disease, kidney disease, male Infertility, chronic fatigue syndrome and hyperthyroidism. L-Ornithine is a nonprotein amino acid. It is used in the body in the biosynthesis of L-arginine, L-proline and polyamines. L-Ornithine is a basic amino acid, positively charged at physiological pH. It is also known as alpha,delta-diaminovaleric acid and 2,5-diaminopentanoic acid. L-Ornithine has putative anabolic, immunomodulatory and wound-healing activities. Choline is a B vitamin-like molecule that is naturally produced by the human body. The body uses choline to produce certain brain chemicals, to mobilize fat, for normal transmission of nerve impulses, and is used for a range of body functions. A diet rich in lecithin food sources enables the body to break this down into choline, or choline can be taken in supplement form. Studies show that it may be an excellent memory tonic having positive effects on our thought processes and mental well-being, as well as muscle control. Choline is used by the brain to make acetylcholine, a neurotransmitter that plays a role in memory function. It helps build cell membranes and move fats and nutrients between cells. Choline aids in reproduction, fetal and infant development, a healthy liver, gallbladder, and heart. Choline increases good cholesterol and reduces bad cholesterol.